There is good reason to doubt the authenticity of this latest ‘beheading’ video. It comes in the wake of the James White Foley beheading, which was so obviously staged that it even prompted one former orthopaedic surgeon to comment that the beheaded corpse looked “like a dummy from an Oxford Street window”. An international forensic group, that often works for British police, analysed the video and concluded that it did not show a real beheading. What really rings alarm bells however is that this video comes via the SITE media monitoring group, which is run by one Rita Katz. And for those who don’t know, Rita Katz has long been linked with Israeli intelligence. Born in Iraq, where her father was tried and executed as an Israeli spy under Saddam, Katz emigrated to Israel where she obtained a degree in Middle East Studies from Tel Aviv University before relocating to the U.S. Since then she’s been providing the world with scoops on terror that often seem to work to Israel’s benefit, if only indirectly. We haven’t seen a video of the alleged beheading so for the time being we’ll reserve judgement. However given the obvious inconsistencies in the Foley “beheading” video, and the fact that it has been followed so quickly by another from a known disinformation purveyor, we won’t be surprised if it’s just more of the same. 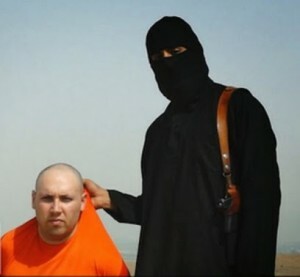 The Islamic State militant group released a video purportedly showing the beheading of American-Jewish journalist Steven Sotloff, the SITE monitoring service reported on Tuesday. A masked figure in the video also issued a threat against a third captive, a Briton, a man the group named as David Haines, and warned governments to back off “this evil alliance of America against the Islamic State”, the monitoring service said. “I’m back, Obama, and I’m back because of your arrogant foreign policy towards the Islamic State, because of your insistence on continuing your bombings and … on Mosul Dam, despite our serious warnings,” the man said. In the video, Sotloff describes himself a “paying the price” for the U.S. intervention in Iraq with his life. Sotloff, a freelance journalist, was kidnapped in Syria in August 2013. Sotloff’s mother Shirley appealed on Aug. 27 in a videotaped message to Islamic State’s self-proclaimed caliph, Abu Bakr al-Baghdadi, for her son’s release. Addressing the leader of the Islamic State group by name, Shirley Sotloff said in a video her son was “an innocent journalist” who shouldn’t pay for U.S. government actions in the Middle East over which he has no control. About two weeks ago, the Islamic State, formerly known as the Islamic State in Iraq and Syria, released a video showing the beheading of U.S. journalist James Foley, who had gone missing in Syria nearly two years ago, and images of Sotloff in an orange jumpsuit whose life they said depended on U.S. action in Iraq. White House press secretary Josh Earnest said he wasn’t immediately aware of the purported Sotloff video and wasn’t in a position to confirm its authenticity. Sotloff was not the first American-Jewish journalist to be executed by Muslim militants: In 2002, Daniel Pearl was kidnapped and beheaded by members of Al-Qaida while reporting for the Wall Street Journal in Karachi, Pakistan.